This is the second of a three part series that will highlight some of the stories covered by Bogota Blog NJ for the year 2015. This post will cover the Months from May to August. The Bogota Ralph Hall VFW post #5561 held it's annual Loyalty Day program. This is a day that is use to recognize the heritage of American Freedoms. 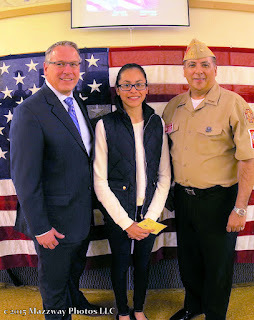 In honour of this day the Bogota VFW awarded winners in two essay writing categories. There were a number of Spring cleanings, along with the planting of flowers to brighten up a Bogota May. The first cleaning happened early in the morning as Volunteer from Jersey Cares went to the Bogota VFW Post #5561 to help remove old leaves, and other debris from around the post. Volunteers helped Bogota Beautiful do their Spring planting of the Planters on W. Main St. The Planters were clean of the old flowers from Earth Day in April. Students lined up in front of the W. Broad St. Firehouse to get an application to be apart of the Bogota Police Emergency Services Youth Academy Class 05. The Fine Arts Dept. of Bogota High School presented their Spring Concert for 2015. The evening started with the Concert Band playing pieces ranging from Disney's themes to music based on native drumming. The Bogota VFW Ralph Hall Post #5561 held a concert in observance of Armed Forces Day to recognize those serving in all branches of the U.S. Military. The evening started with the duet of Bob De Blasio & Tricia Wilson. The a moment of silence for those who were not able return home from the tour of duty accompanied by Louis Santos playing taps. Then the National Anthem was sung by the group Choice. Bixby School held their Spring Concert. This was a combined performance of the Bixby Bulldog Band and the Bixby String section. Before the Parade in Bogota on Memorial Day the American Legion Clifford Dunn Post # 117 and the VFW Ralph Hall Post #5561 held their remembrance service in front of Borough Hall. 26-May-2015 The Borough of Bogota held it's annual Memorial Day Parade through the street of Bogota. The Bogota Police Emergency Services Youth Academy held a fundraising dinner for Class 05. This was held at the Bogota VFW post #5561 hall and allowed graduate and future Cadets along with their Families a chance to meet and have a Saturday dinner together. The Friendship House of Northern New Jersey held its 9th annual Wellness Walk for Mental Health and Autism. The Bogota High School Athletic Dept host the first Michael Granquist Sports Award Dinner. The was named for Mr. Granquist this year after his passing earlier this year. This was the first public announcement that Kevin Bayani would be the new head Coach of the High School Football team. The 18th annual " Step up for the ARC Walk" in Olsen park Bogota. The Fine Arts of Bogota High School held their awards dinner. The Bogota High School Drama Club hosted the WBHS Radio Hour. This was a dramatic presentation of the Classic Radio Shows from the 1930's & 40's. Members of the Bogota Police Dept. and Students from St. Joseph's School took part in the Torch Run for Special Olympics. The Bogota Band Parents Organization hosted their first Bucstock Festival. Bogota High School held their Academic Awards night. The Steen School held it's Graduation Ceremony for the sixth Grade Class of 2015. The Class of 2015 became the 89th to Graduate from Bogota High School. 78 Seniors took Centre Stage at Feigel Field to receive their Diplomas in front of Family and Friends. Bogota Beautiful hosted its first Saturday of Olsen Park Yoga. Over two dozen participate showed up on a early weekend morning to start their day with movement. Exercisers included both Women & Men along with couple and Families all working out together. Bogota Beautiful organized at cleaning of the small lot at the corner of W.Main St & Larch Ave. Volunteers from Bogota including members of Bogota Rescue Squad, a couple members of Borough Council, and residents from the neighborhood took time on Sunday Morning to help brighten up a part of the Borough. The Bogota police Dept. have issued the following alert from anyone who have may witness a traffic incident that occurred on Palisade Ave on Early Wednesday Morning 15- July. The Bogota Police Emergency Services Youth Academy held their graduation ceremonies for Class 05. This was held at the Gymnasium of Steen school in front of Family and Friends of the 57 Cadets who attended this Summer's youth academy. This was the largest class in the five years of the Bogota Police Emergency Services Youth Academy. The Bogota Swim Club & New Horizons Financial hosted an Adult Swim at the Bogota Swim Club pool. Proceeds from this event will go to help fund the Parents for Bogota Football with their support of the Bogota Football Bucs team for the 2015 season. Tito Jackson, former Bogota Mayor, was charged with shoplifting after police said he left a supermarket in Hackensack with more than $400 in items he did not pay for, authorities confirmed on Wednesday. A new business held a grand opening in Bogota. The Men's salon called Mr. Freshcut held ribbon cutting ceremony with the assistance of Bogota Mayor Chris Keleman. Former Bogota clerk Consuelo Carpenter filed suit against the Borough of Bogota because of a violation of New Jersey While-blower act. Earlier this Month Bogota Baseball Organization President Nick Barese announced his retirement after 27 years of leading the BBO. At this time the name of the new President has not been announced. Over the previous weekend members of the Ridgefield Park Boy scout troop #3 repainted the Seniors Center located on the second Floor of the Bogota Public Library. Volunteer scouts , and some members of their families patched, and sanded down the walls of the main room of the Senior Center as well as the kitchen, and back hallway. The Bogota Swim Club hosted their annual sleep over camp and at the pool. This was a chance for families to set up their tents and sleep under the stars for a night. The Kids Safety and Awareness Program held a picnic for Family & Friends to enjoy an August Sunday afternoon. The Bogota Police Emergency Service Youth Academy held an Alumni reunion at the Bogota Swim Club. Bogota Beautiful held a Community Barbeque in Olsen Park. This was a fundraiser to help support some of Bogota Beautiful future projects.